As it may be known, near Patras port gather hundreds of immigrants without papers, mainly from Afghanistan, trying to find a way to Italy and western Europe. Again as it may be known, it is an every-day practice of the cops to attack verbally or physically against them. 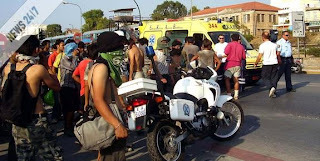 Though, after a brutal beating of three immigrants by maritime cops, other immigrants and solidarians gathered at the hospital there they were kept and marched to the port demanding the release of other immigrants arrested. Maritime cops denied, so clashes erupted, with immigrants throwing dozens of stones towards them, breaking police cars and guard-boxes, while also chased down some maritime cops, some of them later attacked once again against immigrants. After the clash, immigrants and solidarians returned to an area where immigrants area squating with tents, with a march.